Through our affiliation with Chrome Craft, we can offer OEM exchange pins and parts for industrial machinery. Chrome Craft is an expert in quality heavy equipment pins. Serving Industry for over 50 years, their pins are second to no one and are equal to, or exceed OEM quality. 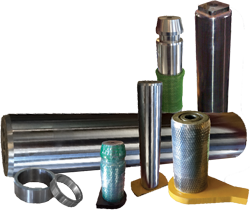 Chrome Craft produces a full line of CAT pins for Scraper hitches (621-657), Loader Buckets and Linkage pins (950B to 994 and larger), larger Excavator Buckets and Linkage pins, Dozer and Ripper pins and pivot shafts, and many more CAT applications. With exchange options available as well. For mining applications, Chrome Craft can tackle large Dipper, Drag Line, and Cable Shovel pins and we stock Snubber pins and Bushings. Having large capacities and a CNC machining facility means they can handle even the largest pins and also can manufacture to your specifications or sample. Chrome Craft has what it takes to rebuild your hydraulic cylinder. They also can manufacture your custom parts. They house a fully capable and complete re-man facility with 3-axis CNC lathe, automatic I.D. and O.D. welders, 20” x 25 foot cylinder hone, and much more equipment. In addition to the Heavy Construction and Mining industry, they can also provide similar parts and services for Forest Products, Oil Field and Refinery, Energy Companies, Public Works, Food Processing and Can Manufacturing, Plastic Extrusion, Agriculture, and Machine Shop Projects. Click Here or the Chrome Craft logo above to link to their Website.